Don’t look now, but location data analytics might actually be turning into a big business. Banjo, a Las Vegas-startup that got its start helping brands analyze location data in social media streams, has raised $100 million in a series C round of funding led by Softbank. In an email to Street Fight, a spokesperson for the company said the company will use the funding to expand its reach beyond the social media ecosystem. The company plans to bring in weather, traffic and even purchase data into its platform — something that could have a big impact for the mobile advertising industry. Here’s how it works. Banjo has divided the globe into a grid, segmenting it into 35 billion 100-meter squares, a technique originally pioneered by ad tech firm PlaceIQ. The software ingests billions of images and other posts tagged with location, and then attributes each post to a corresponding square where the data is stored for either real-time or longitudinally. But the company’s most impressive trick is in pattern recognition. The software can recognize changes occurring at a given place by comparing an image posted at one moment with the collective images posted of that place in the past. 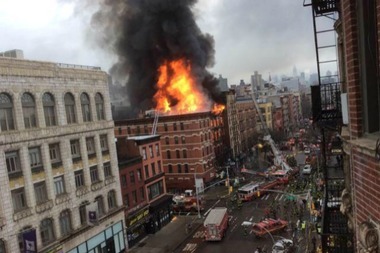 In an interview with the Wall Street Journal, Damien Patton, the company’s chief executive, says the software was able to detect the recent gas explosion in New York’s East Village after a user posted a picture of the smoking building. The company is not without competitors. Boston-based Co Everywhere, which originally launched as an app that allowed users to segment social media posts by location, recently released an enterprise product, Ground Signal, that offers a similar pitch for clients. To an extent, the round of funding marks another example of the way in which media, both traditional and social, is quickly becoming a valuable data source, particular when it comes to location. In the past few years, the mobile advertising exchanges, in particular, have spun out a cottage industry of consumer analytics products, as companies turn the vast metadata appended to ad request into data that can help a world beyond marketers make decisions about everything from store placement to stock shorts. The new round of funding will keep the Banjo independent for a some time, but there are plenty of potential exits for the company — not least from Google. Earlier this week, the search giant said half of all searches now come from mobile, which means that half of its searches, more or less, include the location of that user. Paired with the vast repository of passive data it collects from its apps, the company has the largest still-untapped reservoir of location information. A system like Banjo could allow advertisers to begin to connect the dots between that dataset and the billions of dollars spent on Google each year. Banjo CEO Damien Patton will be keynoting at Street Fight Summit West in San Francisco on June 2nd. More info, agenda, and tickets here.